René Gendreau, Guest Professor (Marketing) and head of the Commerce Games project-course, was very pleased with the performance of all the students who earned the School first, second or third place in 12 of the 17 events, in all categories. 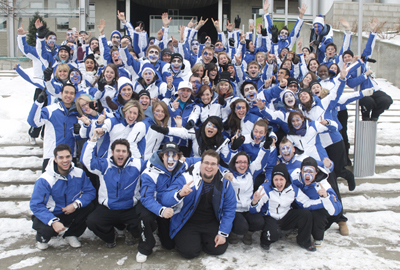 HEC Montréal students have now stood on the podium 18 times in the 21 years of the Commerce Games. Since this inter-university competition was founded in 1989, they have brought home first place ten times, second place four times and third place four times. Debating: Nathalie Elgrably (Full-time Lecturer) and Marie De Léséleuc De Kerouara (BBA 2008). * HEC Montréal students pitted their skills against their counterparts from the John Molson School of Business at Concordia University, the Telfer School of Management at the University of Ottawa (1st place), the École des sciences de la gestion at the Université du Québec à Montréal, the Université de Moncton, the Université de Sherbrooke, the Université du Québec à Chicoutimi, the Université du Québec à Rimouski, the Université du Québec à Trois-Rivières, the Université du Québec en Abitibi-Témiscamingue, the Université du Québec en Outaouais, Université Laval (3rd place) and McGill University.